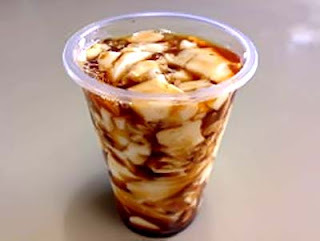 Taho is a Philippine delicacy made of fresh soft/silken Tofu, Arnibal (brown sugar syrup), and Sago "pearls" (which are similar to Tapioca pearls). This staple comfort food is a signature sweet; and can be found all over the Philippines. Taho vendors process their goods early in the morning, usually before dawn. The main ingredient, the fresh soft/silken Tofu, has a consistency that is very similar to a very fine custard or a Panna Cotta, although it is much softer. The brown sugar is heated and caramelized. The Sago "pearls" can be purchased in local markets, or palengke. Vendors are a common sight in the Philippines. They are normally male and carry a contraption that consists of two large aluminum buckets specifically designed for taho carriage, and a long narrow wooden plank, where these two buckets hang on each end. The vendors herald "TAHO!" while walking at a considerable pace along the sidewalk. Hopeful customers also scream "TAHO!" to get the roaming vendor's attention. The vendor then drops his load while the customer watches. The vendor gets a cup (the customer either picks a small 5 peso cup or a larger 10 peso - some even bring their own containers), scoops up the taho in one special bucket and then adds the sago and arnibal. It is enjoyed warm (although there is also a chilled taho variant) and is eaten with a spoon or sipped straight from the cup. 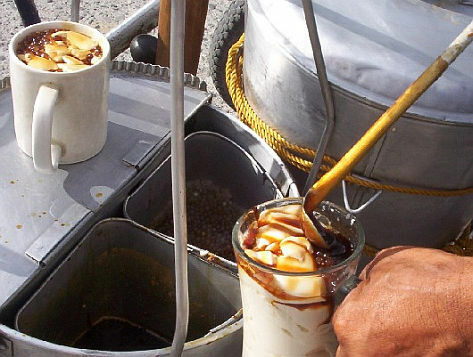 Today, there are also several Taho stalls available in commercial malls and supermarkets.